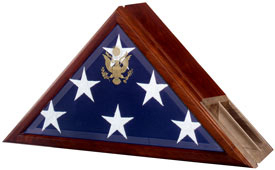 Our flag case and urn incorporates our Presidential flag case profile with a built-in urn compartment (225 cubic inch capacity) in the back of the flag case. Our flag case and urn incorporates our Presidential flag case profile with a built-in urn compartment (225 cubic inch capacity) in the back of the flag case. Embossed Great Seal of the United States on elegant beveled glass. Heirloom Walnut finish and hinged lid, concealed magnetic closure and dust seal to preserve your flag. Solid wood finish back. Wall mountable.